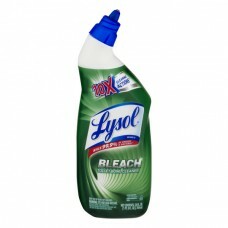 Lysol® Toilet Bowl Cleaner Bleach. 10x Cleaning actions?. Brand II. Kills 99.9% of viruses & bacteria**. Net contents: 24 fl. oz. (1 pt. 8 fl. oz.) 709 ml. This product has 3x cleaning power to remove limescale, rust stains, and organic soil. Thick liquid formula sticks to the bowl for better cleaning. Whitens and brightens toilet bowl. Cleans as it disinfects. Contains no phosphates. **Kills salmonella enterica, staphylococcus aureus, enterococcus faecalis, pseudomonas aeruginosa, rhinovirus type 39 and rotavirus WA. ?On limescale, organic soil, rust stains, urine stains, destroys stains under rim, below water, cleans, brightens, clings to the bowl, whitens. This bottle is made of 25% post-consumer recycled plastic. rb - Health. Hygiene. Home. EPA Reg, No. : 777-102. EPA Est. No. : 777-NJ-2 (B), 777-M0-1 (S). Beginning lot code indicates EPA Est. No. 8282794. Questions? 1-800-228-4722. For ingredient and other information, www.rbnainfo.com. © 2017 RB. Directions for use: It is a violation of Federal law to use this product in a manner inconsistent with its labeling. Read the entire label before using product. Apply carefully - contains bleach. This product should not be used or placed on toilet bowl lids, vanities, sinks, bathtubs, cabinets, countertops, rugs, etc. Clean up spills and drips immediately. Will not harm plumbing or septic systems. To open child resistant cap: Hold bottle firmly with one hand on a flat surface. With other hand, squeeze sides of cap where indicated while turning counterclockwise. Do not remove cap. Avoid squeezing bottle when opening. To reseal, twist cap clockwise until tightly closed. To clean/disinfect/sanitize: 1. Flush toilet before cleaning. 2. Apply 6 oz. to coat the bowl including under the rim. Do not dose lid. 3. To clean: Scrub entire bowl and under rim thoroughly. Disinfect: Let sit for 5 minutes. Sanitize: Let sit for 30 seconds. Then flush. 4. Rinse brush in fresh water after use. Repeat if needed. Storage and disposal: Storage: Store in original container, in a cool, well-ventilated area, inaccessible to small children. Keep securely closed. Pesticide disposal: To avoid waste, use all material in this container according to label directions. Container disposal: Non-refillable container. Do not reuse or refill this container. If empty: Place in trash or offer for recycling, if available. If partly filled: Call your local solid waste agency for disposal instructions. To open child resistant cap. 1. Place fingers on marked cap ridges. 2. Squeeze cap firmly and turn counterclockwise until it stops. Do not remove cap. 3. To reseal, squeeze cap again and turn clockwise. Do not squeeze bottle when opening.